If you’re looking for cool pictures, an epic tale, or a story that’s going to make you want to get off the couch this very instant, you might want to scroll past this post. Maybe skip it. Maybe come back next week, or the one after. Because this post is dedicated to the rain in sheets on the windshield. The forgotten boots or skis or skins. 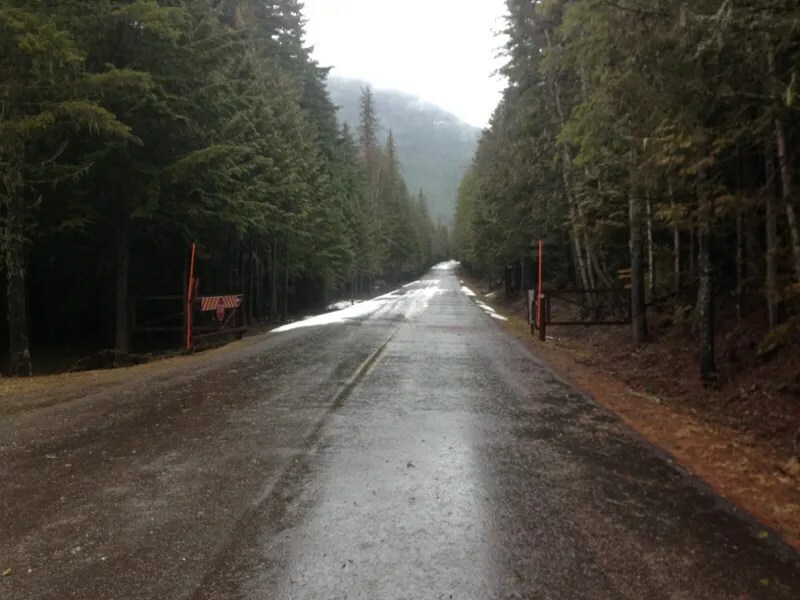 The times only a mile in, and everything was scuttled by something unchangeable, something hideously unsurmountable, something that omnipotently smashes your plans and leaves you repacking the car with all your food and gear unmuddied and unused. This is about non-adventure. Let me break this down a bit. Duct Tape Then Beer, those purveyors of fine outdoor creativity, are fairly well known for how they break down fun into different types. Type One is easy to plan, easy to execute, and goes great. Type Two sees more of the suffering, some difficulties, and makes for a much better story as a result. Type Three is a bad idea to start with, has its moments of serious pain, endangers your life, and leaves you with a sense of satisfaction and accomplishment that reverberates through the rest of your life. Type Three is the kind of touchstone experience that your friends get tired of hearing about, because you keep remembering random facets about it, and everything links back to that one time in the Himalaya or on the Grand or when the luggage didn’t arrive in Uzbekistan. In thinking about non-adventure, and trips that never even got close enough to success to be considered failures, I’ve started with the Types of Fun. Straight up, grade A adventure applies to all three types. Mis-adventure, its close cousin, has more to do with Type Two and aptly describes much of what gives Type Three its intensity and staying power. However, non-adventure is in a class by itself, precisely because it has no real accomplishment to speak of. It’s not Type One, because it didn’t go well. Or maybe didn’t go at all. Type Two and Type Three fun are redemptive because something amazing is the outcome. Other than the blatant and obvious lessons to be learned, non-adventure doesn’t have that amazing something. Whatever the colossal mistake was, that becomes the large take away, with no significant tinge of achievement to sweeten the difficulties encountered. Two or so weeks ago, I spent much of a rainy day off from coaching emailing, running about, and generally doing things that I wouldn’t consider fun or adventurous but are necessary to lay the groundwork for future fun. 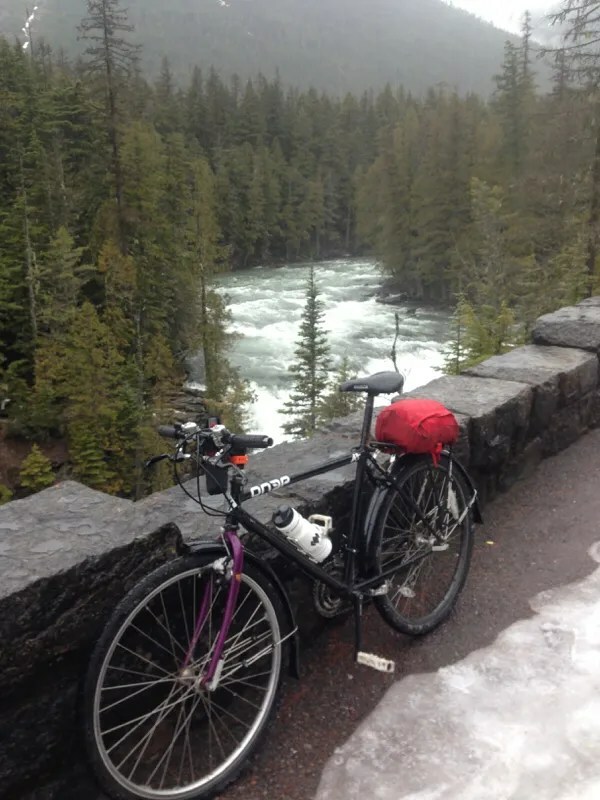 My bike, so aptly suited to approaching ski projects in the spring, lacked the key ingredient to surviving wet trips without getting wet: fenders. So I picked some up, did the work to put them on, and thought I’d head for the Going to the Sun highway to test them out. Maybe I could ride to Avalanche, then hike on snow and mud to Avalanche Lake. Great late day, solo activity, with all the potential for Type One fun, added to by the snow and limited daylight, which offered a strong chance of Type Two. After packing up, I headed out. Rain started in West Glacier. By the time I hit Lake McDonald Lodge, things were really coming down. The Fender install was feeling smart already. There’s a human smugness about thwarting the elements with technology, like wearing a good hardshell in a storm or snuggling into a fat sleeping bag as the temperature drops. That smugness gives just a little bit of triumph, something I was feeling as I rolled out of the parking lot in my hard-shells, water already flowing out the bottom of the new plastic on the fenders. But a mile in, after a couple patches of ice, I rolled up the hill past the Kelly Camp road to find a foot of snow completely covering the road. Maybe twenty minutes had gone by. I was finally feeling warmed up. And unless I wanted to walk a couple miles through patches of snow, to walk up more patches of snow on the trail, things weren’t going any further. What had seemed promising completely evaporated. For those of my local friends who keep advocating for me to get a fat bike, this is an official admission that it would have completely solved my problem: I had the wrong gear for the conditions, and a mindset that wasn’t adaptable enough to keep after it by myself in the limited afternoon light. Melting snow fueled the roar of Mcdonald Creek, the flow swollen just a little bit more as my day washed back downstream along with the snowpack. Saving grace: it’s still pretty, even a little ways in. I hung out a bit at a pullout that will be clogged with visitors in a few months, savoring the quiet, and then hopped on and headed back. There wasn’t much to report, much to think about. Snow blocked the road. Things weren’t happening. Despite the lack of snow for a couple thousand feet up the walls of the valley, it still wasn’t off the road, sheltered by the trees and their shade in the sun that hadn’t protected the valley walls. As I mentioned in the beginning, this blog has plenty of cool photos and stories for people to look at–and that’s by design. Like much of the outdoor content on any social media platform, there’s a targeted focus on being worthwhile and interesting in what I write and blog about. However, all of those platforms and media came around long after the practices and places in the real outdoors. Gorgeous conditions and perfect shots are far more rare than they appear when that’s what’s mediated constantly, and more than anything, I want there to be authenticity in my outdoor thinking, doing, and writing. Hence this post. Hence all these words. Hence delving into non-adventure, spurred on by my decidedly non-epic, unawesome, somewhat non-interesting bike ride, the biggest byproduct being all of this here. If nothing else, I want people to know that there’s so much more to the outdoor life than when everything goes perfectly. Most of the time, the stories get better the minute things stop going perfectly. But there are still those days when it goes so poorly that it’s not worth writing about, telling about, or even discussing unless the whole point is to provide contrast with bluebird, perfect conditions. And thus, I say happy non-adventuring. What, for once I leave your page not full of envy . . . keep writing ( unlike me) . . .
What, you don’t feel like a short bike ride in the rain? Haha, glad you’re not finding after non-adventure. It just happens, but shouldn’t be something you go searching for. It’s worth noting that this was a couple weeks back, and they’ve since plowed the road to past Haystack Creek, so the main issue from my non-adventure is gone (until it snows again). Haha, you make a great point about bringing kids. Depending on the age, they can make nearly anything into a non-adventure for adults, but that’s because they’ve got a perspective to where playing in the mud and stacking rocks for hours is way more worthy than, you know, walking somewhere. And their philosophy isn’t wrong at all. Well put! I’ll share it with the RIDGE world! Thanks for this post! I’ve really been enjoying your writing! Love your well rounded account of skiing and your general perspectives on mountain life/ recreation. Cheers!